Many people are reluctant to spend that money instead opt to use one of the DIY car dent pullers that are out there. But do these actually work? In some cases they do, but you need to be aware of all of the factors that determine whether or not dent pullers work so that you know which one to use and what technique is best. 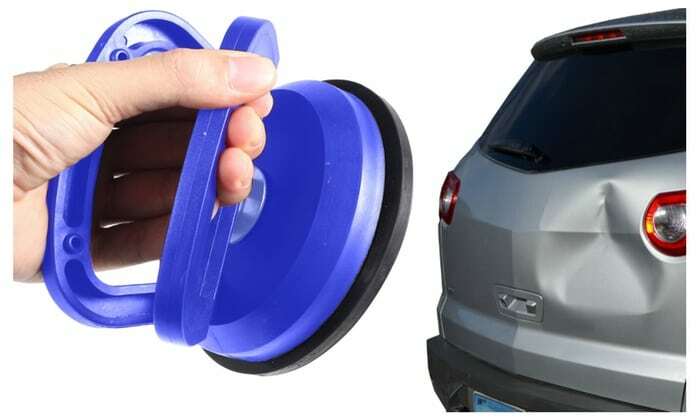 These work by attaching to your car with suction, allowing you to pull the dent out. They work very much same way as a toilet plunger. Glue dent pullers are a little different. Basically, you glue a flat pulling tab into the dent and allow the glue to dry somewhat so that you can pull it out. The problem with this method is that you need to make sure beforehand that the glue is not going to cause your car more damage than the dent did. Dent pullers only work on shallow dents on flat, flexible surfaces. They can improve the appearance of dents but probably won’t create a perfect finish. But these tools will not work on deep, angular dents or damage along the edges of bodywork. Dents in areas of thick metal will also be very difficult to remove at home. Finally, do not attempt to use a dent puller on damaged paintwork – you may cause more damage. If you use a car dent remover repair kit and cannot remove your dent – stop. Don’t risk creating further damage to your car. Dent pullers have limited use and are not suitable for removing most types of dent. For large, deep or stubborn dents, always take your car to see a professional.